Like many of us, Ruth Rollin, a tattooist and Unite community member from Leeds has been deeply saddened by the images of Syrian refugees in the media. The body of little Aylan washed up on the beach left the nation shocked and dismayed that our government is not doing more to help people fleeing war torn Syria. Ruth, who owns Red Tattoo and Piercings in Leeds decided she was going to do something to help. Ruth met her husband Joe Rollin, a Unite organiser, eighteen years ago through their anti-fascist campaigning. It was Joe who suggested that she raise some funds for the community centre in Barnsley that he had set up two years ago. Red tattoo studio has four resident tattoo artists and two body piercers and has a steady flow of regular and new clients. “What is happening in Syria is so awful,” said Ruth. “I think so many people want to do something to help but maybe don’t know how,” she added. Ruth decided she would donate an entire days takings towards funding English for speakers of other languages (ESOL) classes for asylum seekers at the Barnsley community centre. The team at Red Tattoo raised £1,500 to go towards the Unite Learning project which the Unite activists are planning on expanding. She also set up a drop off point at the shop where local residents could donate items for refugees in Calais. “It’s about helping those who are already here but also helping those stuck in the jungle,” said Joe. The items donated will be driven down to Calais and the money raised will be used to help those who want to learn English but can’t afford to pay for the lessons. Joe joined Unite as an organiser for the community section, which helps give people out of work a chance to organise and campaign to improve things within their local communities. It was Joe’s idea to find somewhere as a base for his community members to get together. “Organising people who aren’t in work is really hard as you don’t have anywhere to meet,” said Joe. “Members in employment would have meetings at their place of work,” he explained. Joe went to the National Union of Miners (NUM) headquarters in Barnsley with his idea of creating a space to organise people who aren’t in employment but want to be part of the trade union movement. “The biggest cause of unemployment round here is the closure of the pits,” said Joe. “The NUM bought into the idea and gave us the space for free,” he added. It hasn’t been easy though. When Joe started out the centre had just one room and one computer. But it has gone from strength to strength. The centre is a place for campaign activity around issues like the bedroom tax, welfare cuts and sanctions. They have also run their own campaigns to save free travel for the elderly and disabled, fought the closure of sure start centres and they collect food for the local food bank. Now with the money donated by Red Tattoo and Piercings the centre will be able to offer free ESOL. “Being able to offer ESOL at the centre means we can reach out even further and help those who possibly have language as a barrier,” said Joe. 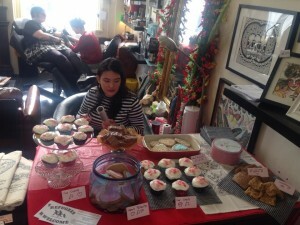 As well as a whole days takings Red Tattoo also sold donated cakes, gifts and artwork to help raise money. Vicki Dawson, who works at the shop and is also a Unite community member told me that the day was a real success with regular and new customers. “We didn’t know what reaction we would get from customers but it was really well received,” she said. Staff had put up flyers before the day and lots of people turned up as walk in appointments for piercings and tattoos. “It was great as people could come and get something done for themselves but know that their money was going to a really good cause,” said Vicki. Comments Off on Community tattoo!